Graphic design can be the most time-consuming aspect of sign making. Time lost fussing over a sign layout can impact the bottom line or turn a marginally profitable job into a money loser. That’s why there are lots of features in Vinyl Express LXi Master 12 software designed to make your work more efficient. One of them is the Graphic Styles feature. Using Graphic Styles can streamline your design process and save you time and money. What is it, how does it work? 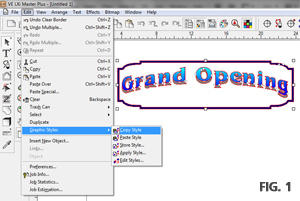 What are LXi Master Graphic Styles? Simply put, the Graphic Styles feature is a way for you to use LXi Master to quickly and consistently apply various effects or combinations of effect to objects in your layout. The function is found in the Edit Menu. Edit/Graphic Styles. The options include Copy Style, Paste Style, Store Style, Apply Style and Edit Style (See Fig 1). 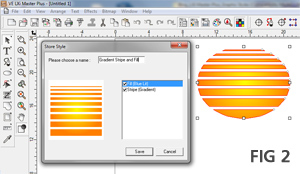 By the way, you’ll find the same useful feature in FlexiSIGN and FlexiSign and PRINT 12. 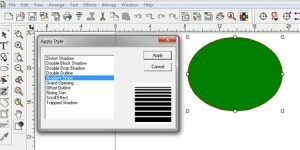 If you’re starting from scratch, you might begin by drawing and selecting a shape, then opening the Apply Style Box. You’ll see a menu of nine predesigned Graphic Styles you can apply to the object. These include Gradient Stripe, Scroll Effect, Offset Outline, and several Shadow effects. Clicking one will instantly apply it to the selected object. What if you like one of the Graphics Styles, but would like to customize it? Maybe you want to add a gradient fill to the gradient stripe effect. No problem. You can use one of two options. 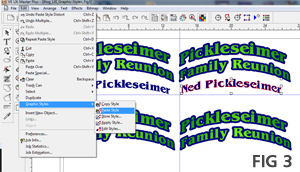 To apply your modified style to another object in your design without saving it, use the Copy Style/Paste Style tools. To save the custom style to use in future designs, click the object to select it, then choose the Store Style option. You’ll be prompted to name the Style and a list of the style attributes will be displayed for you to review. You can include some or all of them in the new Graphic Style (See Fig 2). Once you click Save, the new feature set will be added to the Apply Styles Menu. Then you can apply the same custom design to a layout in the future with a couple of mouse clicks. This is ideal for sign makers who want to set themselves apart in a crowded marketplace. In addition to marketing your unique design sense, there are other practical productivity gains to using Graphic Styles. One of the simplest ways to use Graphic Styles is in the same manner as using a pre-designed sign template such as those found in Sign Power or other clip art libraries. If you create a terrific Grand Opening banner with a distortion and a drop shadow, you might want to make that a staple of your shop. Storing it as a Graphic Style makes that a snap. More style points means more value to the customer, and money for your shop. There’s a reason software with more features costs a little more. Those features, developed from years of feedback from sign makers just like you, help you to design more effective graphics and do it more efficiently. More effective designs help you win battles with the competition. More efficiency helps the bottom line. So better software is an investment in your shop’s survival and success. If you’re using low budget generic software, consider the advantages of switching to real sign software. You might want to start here. If you already have a lower level of LXI and feel the need for an upgrade, give us a call.